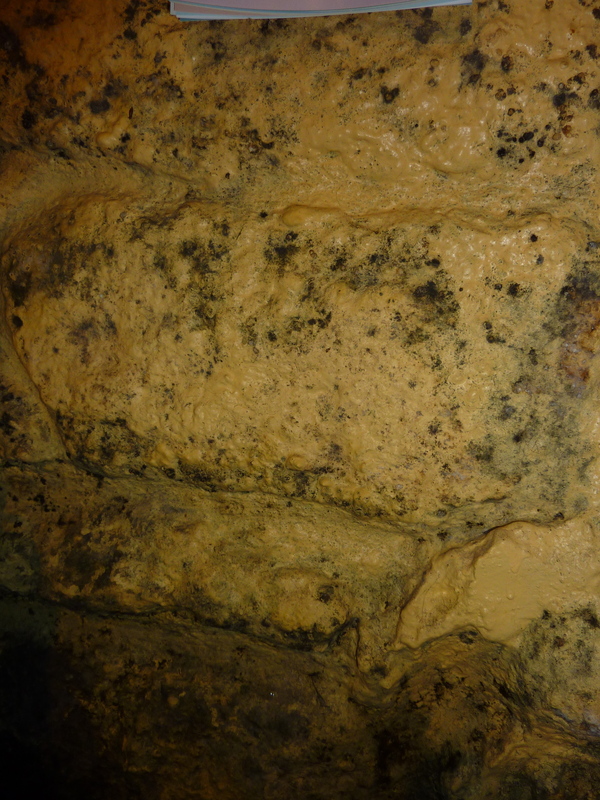 Roger and I are continuing to work on removing paint from two internal granite stonewalls. I should amend that statement: We are continuing to explore ways in which to remove paint from these walls. This is no easy task and has introduced delays to all other aspects of this renovation project. The floorboards are sanded and ready to be installed into place, but are sitting in the barn. The ceiling, wiring and lighting are all on hold. We can do nothing more until we get the paint from the walls. Then, we will be able to power ahead with finishing this room and beginning the next. We are now all too familiar with how one little snag can hold up our projects for weeks, if not months. Part of the wall awaiting paint removal. What the walls want to do if we don’t get rid of the paint. 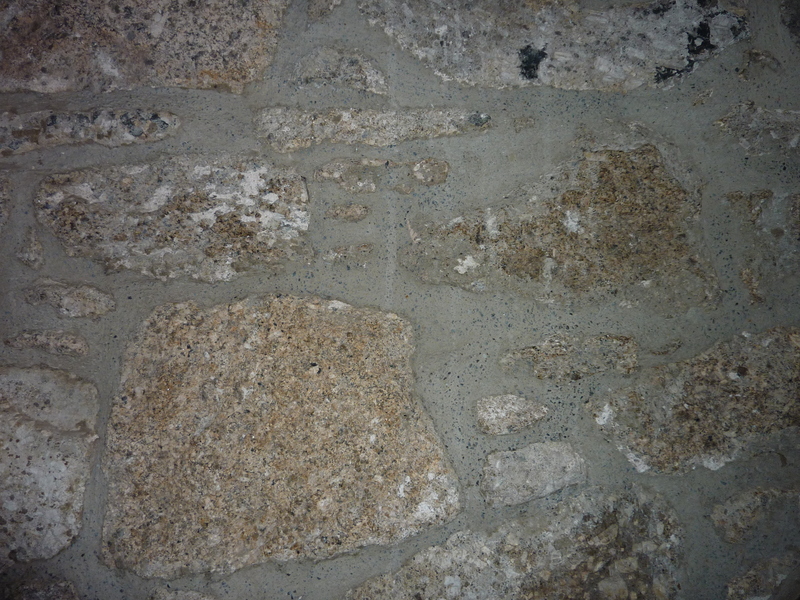 Painting granite stones is a decision that should not be approached lightly as its removal is no simple matter. We have tried scrapers, sandpaper, wire brushes attached to either our hands or to drills and all to little effect. I read about Soda Blasting, which is a dry and environmentally friendly approach to clearing the walls using baking soda crystals moving at 600 miles per hour. Sounds great and hours of YouTube viewing told us that we could build our own blasting gun, buy baking soda in huge tubs, and we would have success. More viewing indicated success was the domain of gear-heads who wish to remove gunk from vintage car parts. Our internal, bumpy, porous granite wall requires another solution. While we both work hard, it’s safe to say, our general approach to projects plays to our strengths. I like the planning, dreaming, and logistics. Roger is the researcher. Sam likes walks. I could fill these posts with Roger’s efforts which not only save us money, but help us to accomplish projects without having to re-do them. Sure, we stumble sometimes, but mostly, we make progress in small, but fairly precise steps. Not discouraged, more investigation indicated we could purchase equipment to do our own “blasting”, but being on a generator made this a troublesome proposition. A steep, downward slope of money-spending, mess-making, and no-guarantee of success awaited. We invited someone out to have a look. “Oh yes, I can do that. Sure, we bring our own generator. Yep, we’ll build a containment wall to minimize the mess. No, you can’t do it with soda, you’d need to use….” And it was at this point that I checked out seeing nothing but huge costs and huge mess. Still, it was an option. Roger had placed on the wall two test patches of a peel away paint stripper known to remove paint from stones. One patch used a non-toxic paste, which was covered with the peel away paper. The other spot had a caustic paste. 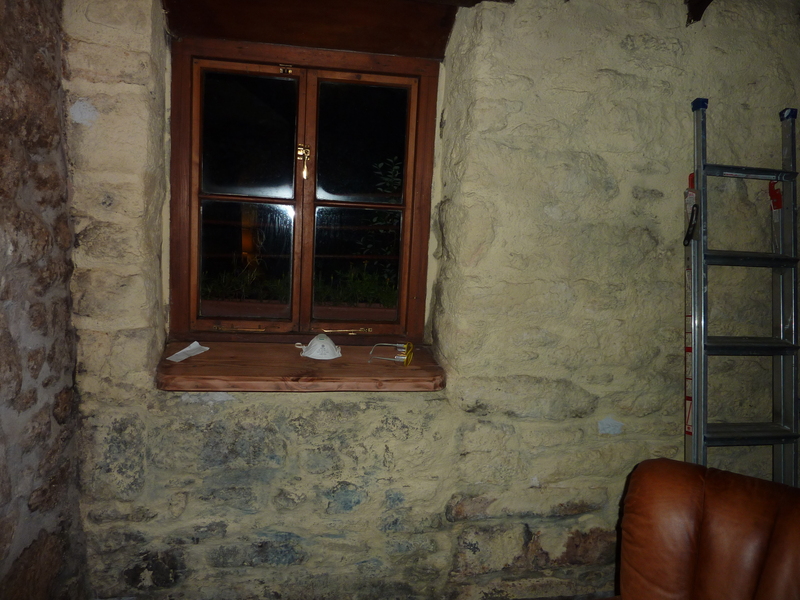 I didn’t like the idea of this one, as we are looking to remove paint from about 20 square metres of wall. That’s a lot of potential skin damage. While I listened to Roger’s explanation of the pros and cons of these two paint strippers, I noticed another patch on the wall uncovered by peel away paper. In this area, Roger had put porridge. I love porridge. It sets the day off to a good start. Low calorie and high in protein, this superfood may be the key to living longer according to a study by Harvard University. Who knew, it could also strip paint from walls? As I stood there looking at the three patches, I wondered if my stomach lining was being affected having had the cooked oats earlier in the day. Three patches. Top left is the caustic stuff. Top right is the non-toxic and worked well. The little brown blotch at the bottom is porridge. 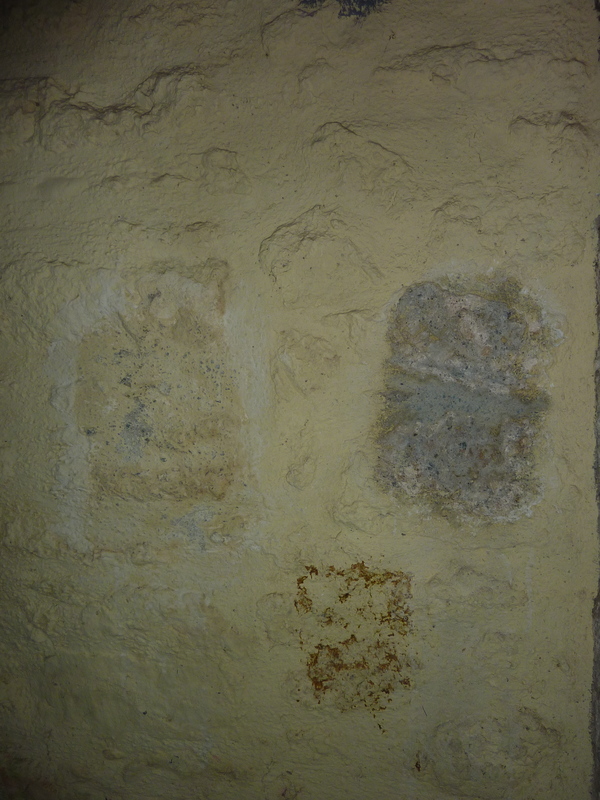 One of the walls without paint. Looks great and so this is our goal. Having given it a try, we can report porridge may work on plaster or wood, but not on granite. Happily, we had some success with the test patch of the non-caustic stripper, so we’ve ordered enough to do one of our two walls. It arrives in a couple of days and that will be one of our projects as we move toward the holidays. I’ll need to get my letter to Santa ready soon and see if he can send some elves to help! I am happy to be sending this letter to you now, as I was admittedly late last year. You must receive millions of letters this time of the year, but I hope your administrative elf-team bump mine up to the top of your in-box, giving you time to read it and know Roger and I are thinking of you. I’ll assume you, Mrs. Claus, the Elves and all the Reindeer are all happy, healthy and ready for your upcoming big night of global gift giving. What a job you have! This is my third letter to you in as many seasons from Crockern Farm. But you knew that already with those special powers of seeing people when they are sleeping and knowing when they are awake. That, and you follow the blog which pleases and delights me no end. I don’t have much for “the list” this year but wonder if you might consider sending a few of your elves our way to help finish up a project or two. We have had a very busy 2014 and sometimes could use the extra help. An elf’s work ethic is beyond compare and they could easily provide us that necessary push. I’m not suggesting now; oh no, it would be impossible for you to spare any help during the holiday season! What I had in mind is an off-season visit, say January? You and I agree everyone is entitled to some well deserved R&R, so my idea is to send a few of the elves to Crockern for a working holiday. These sorts of get-aways are all the rage lately. 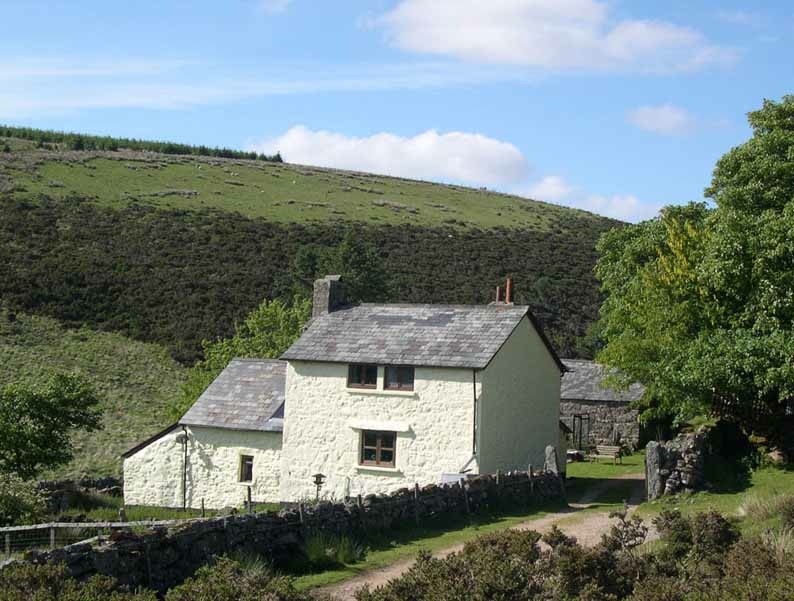 Plus, the reindeer might enjoy grazing on the moors along side the sheep and Dartmoor ponies. Perhaps you could address this proposal with Boss Elf at the next staff meeting? Roger and I owe you many thanks for granting our holiday wishes last year. We finished the upstairs living room in April and immediately turned our attentions to the downstairs. Admittedly, we started the downstairs project over two years ago when we replaced the old, rotten beams. But now, the bedroom and bathroom are framed, insulated, and plastered. The floors are in, along with the plumbing and electrics. There are a few final carpentry details, which may take some time to complete, but the biggest remaining projects are to lay the tiles in the bathroom and then install the bathroom fixtures. Are you certain you can’t send an elf or two along to help? A hearty thanks is also in order, for helping us with a good year for our garden. The weather was on our side, and we learned a thing or two from previous planting experiments, which resulted this year in a terrific crop of lettuces, potatoes, cucumbers, tomatoes, chard, spinach, kale, cabbages, celery, celeriac, beets and onions. Even now in the midst of winter, the garden is providing us lettuces, spinach and cabbages. If you wouldn’t mind, could you send our thanks to Mother Nature when you see her at the New Year? We would love to put in our request for another splendid summer for 2015. Along with the garden, we had so many opportunities for BBQs and evenings in the hot tub. If your summer schedule permits, pop over for a visit, as we’d love to see you and Mrs. Claus. As you know, our chickens had a challenging year. There were two daytime fox attacks and a horrible dog attack. The badgers attempted to burrow into the coop, too! That said, the current flock is looking happy and healthy. With the strong housing, extra fencing and now the electric fencing, they are as safe as can be. The chickens have asked if from your global travels you know of any parts of the world wishing to re-home a fox? We have one nearby and the girls wouldn’t mind seeing him living a little farther away. We are excited for the holiday season. That said, I had a rough day the other day when I discovered some mice had chewed their way into a box of Christmas decorations and nibbled a nice hole in the stocking my Mom had helped me knit when I was young. That made me sad, and I’ll admit it, ready to wage war on the mice. But as you’ve taught me Santa, to have a jolly disposition, you’ve got to turn a bad situation into something better. I may have said more than a few disparaging remarks about the mice, but later that day, when Sam and I returned with a Christmas tree, all was right with the world again. The tree is up, decorated and ready for your arrival. Roger and I love Crockern as it remains magical. With all of its history and adventures, the projects and quirks, the visiting critters and various challenges, the coziness and the beauty, both inside and out, it continues to captivate and enchant us. We have learned a lot about life, death, and the surrounding environment by being here. We’ve had to make peace with the food chain on more than one occasion as we bear witness to predation. Mostly, each day is filled with some wonderful adventure and discovery, which underscores our sense of place and belonging. Safe travels Santa. I hope the weather will be clear and bright for you as you take your sleigh across Dartmoor. Those rains last year had to be nightmarish. Since it is likely to be wet and windy, don’t forget to wear your waterproofs. No one would want to see that handsome red suit of yours damaged from precipitation. Also, please take special care when landing your sleigh at Crockern. As I mentioned earlier, we had to put up an electric fence and I hate the idea of you and your team of reindeer getting tangled in it. You may wish to just land on the track and come through the front door. p.s. We’ll leave your favourite tipple on the kitchen table along with some carrots and apples for you to provide to the reindeer. 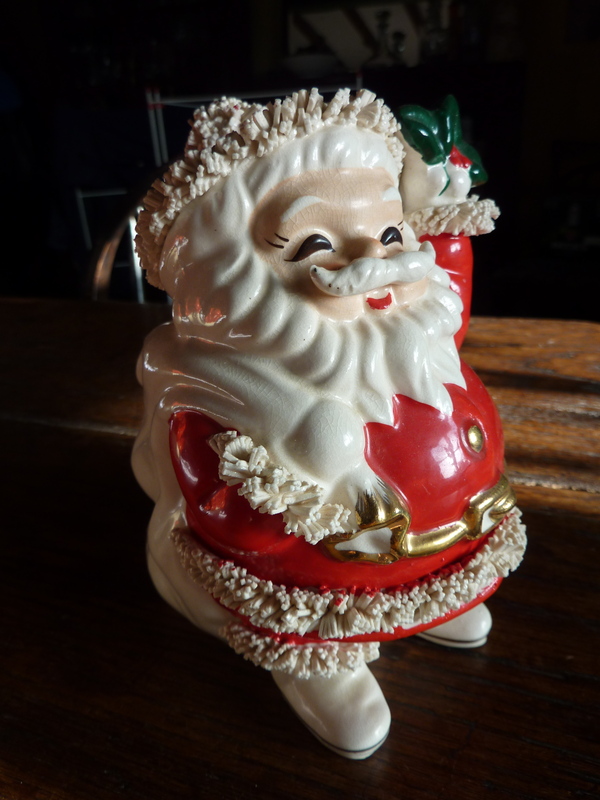 Santa “piggy bank” which I’ve had for as long as I can remember. I hope this finds you, Mrs. Clause, the Elves and Reindeer all happy, healthy and enjoying a restful recovery from your big night of global gift giving. I imagine you had some challenges flying your sleigh through Dartmoor, as the weather was most horrible with gale force winds, biting cold and a lot of rain. 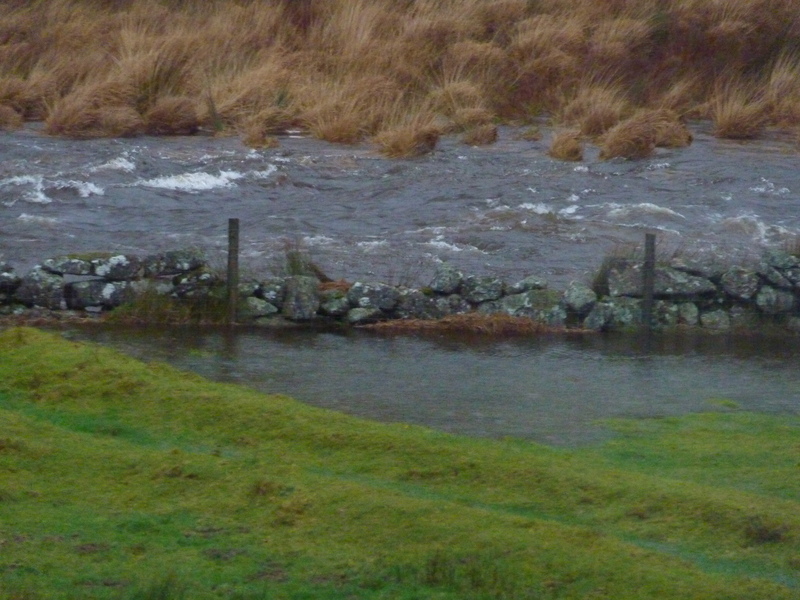 We even lost part of the stonewall when the river breached its banks, taking a few huge granite stones with it. I know how heavy these stones are and my finger still remembers how much injury they can wield, so respect to the river. 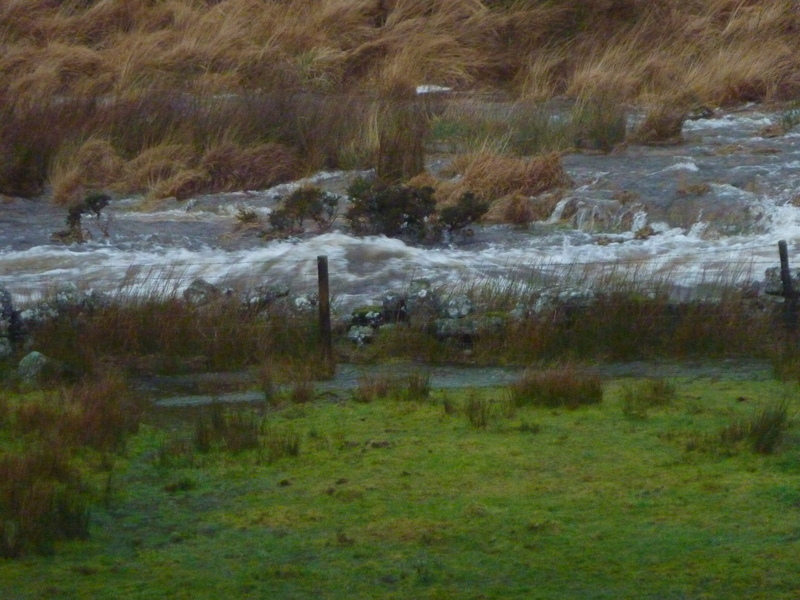 The West Dart River breaks its banks. Taking some of our stonewall with it! I had intended to write you before the holidays, but found that time just slipped past. After completing the ceiling in the living room, Roger and our friend Andy, started the downstairs project. It is a messy, cold and a big project that seems to create chaos everywhere in the house. Meanwhile, I have been working daily at a local cheese shop to lend a hand during the holiday rush. In the last few days before your arrival, I did my best to tidy up the house, but found I had to repeat my Thanksgiving trick and shut the door to hide the renovation efforts. Fingers crossed, you didn’t notice. This is my second letter to you in as many seasons from Crockern Farm. But you knew that as a regular follower of the blog and the possessor of those all-mighty powers to see us when we are asleep and awake. I re-read my letter to you from last year and wish to thank you for your attention to my requests: The roofers finally finished their work and we have felt warmer and dryer ever since! And, the recent installation of our new boiler is fantastic; providing a new warmth and energy efficiency. What a difference to the house! Our hens have asked me to thank you, too. They love their drier and safer home. They enjoy the nesting boxes, but sometimes prefer to lay their eggs in places where we have to go on a hunt. That day I found 7 eggs under a pile of branches outside was a stroke of fowl genius, but not, as I’m sure you would agree, at all sensible, as it would only attract predators. I had a good chat with the girls, reminding them to avoid being naughty. Since then, there have been no more eggs out in the wilderness. These past few weeks, the chickens have been busy with finishing their molting. Between that and having less daylight to enjoy all their chicken-y behaviours, they have pretty much stopped laying eggs. They have also had some real challenges with the recent stormy winds, so who can blame them for their change in production until the days are longer. It also goes without saying that we must thank you for helping us with a good year for our garden. We certainly had a few failures, but as you’ve always reminded me, Santa, we learn from our mistakes, so I won’t be trying sweet corn again! I would love to have another summer of warm days and sunshine like we had in 2013. Would it be too much to ask for you to put in a good word to Mother Nature on that front? It sure would help our efforts to improve our veg production in the New Year. We haven’t seen much of the rats this year and I don’t know if it is because the moles have invaded us. Do moles scare rats away? I don’t know, but I can say with certainty that moles DO seem to make all sorts of uneven terrain. I recently tripped over one of their tunnel mounds and almost did a face plant in the mud. Instead, I opted for a tremendous dance move, which shall never again be repeated. Oh Santa, you would have had a jolly ole belly laugh if you had witnessed that! We love Crockern and all of its history and adventures, the projects and quirks, the visiting critters and various challenges, the coziness and the beauty, both inside and out. On a clear night, we happily gaze at the night sky with our naked eye or through the telescope. Soaking in the hot tub remains a gift of pure delight when the wind isn’t tipping the Beaufort scale. We know we have learned a lot about life, death, and the surrounding environment by being here. We’ve had to make peace with the food chain on more than one occasion as we witness nature, complete with its predation. My finger remains less than 100%, so I’m not thrilled about having to lift big stones again to mend the fallen bits of wall. Then again, we may just give over this part of the field to the sheep and the river, ceding that we are not equal to these elements. I hope you, Mrs. Clause, all the elves and the reindeer have a happy and healthy New Year. My resolution for 2014 will be to carry on as we did in 2013. We’re having a great time and continuing to evolve. If your summer schedule permits, pop over for a visit as we’d love to see you.